He had a point. Now, almost ten years later, what keeps me in Georgia are, for the most part, my friends and the people I can rely on – my social circle. Many people around me feel the same way. 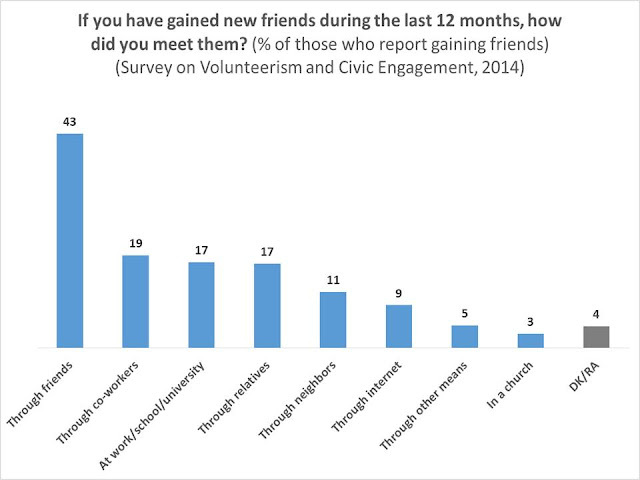 The findings of CRRC’s 2014 survey on Volunteerism and Civic Engagement let us see how valuable social networks of friends, relatives and neighbors are for Georgians. The overwhelming majority of Georgians (92%) say they have close friends. Of these, 21% report getting together with their close friends every day, 34% at least once a week, and a further 22% at least once a month. If we break down the data by gender, we see that compared to females, slightly more males manage to meet with their friends on a daily basis (24% vs 18%). Also, young people (18 to 35 years old) manage to get together with friends more frequently than those who are older (30% vs 16%). At the same time, most people in Georgia are quite open to new friendships: 73% disagree with the statement that they already have many friends and do not need to make new friends. Roughly the same share (74%) agrees with the statement that they enjoy meeting new people. Half of the Georgian public reports they have not gained new friends during the last 12 months. For those who did though, new friends are most often found through the old ones. Note: Respondents could select more than one answer option. Close relatives are another important part of social networks. Half of the Georgian population reports seeing close relatives who do not live in the same household at least once a month. The majority (66%) say they always or often discuss private problems with them. Neighbors represent another important part of Georgians’ social networks. Fifty-six percent of the population says they know all the neighbors in their neighborhood. Another 24% says they know more than ten families in their neighborhood, and only 17% knows ten or less families. The share of those who know all of their neighbors is higher in rural settlements (68%), in the big cities (57%) and in other urban settlements (66%), compared to Tbilisi, where only about a third of the population (34%) report so. Knowing their neighbors implies talking to them, and 64% of Georgians say they talk with their neighbors every day. Another 25% say they talk at least once a week. These talks with neighbors quite often turn into discussing different issues. Twenty-nine percent report always or often discussing common problems in the neighborhood, and 23% say they always or often discuss politics with their neighbors. These results show that Georgians do not lead isolated lives. They have people around them whom they can trust and count on when it comes to good and bad times. Half (52%) of Georgians agree with the opinion that there are plenty of people they can rely on when they have problems, and 74% say there are people who would look after them if they needed to, without expecting any compensation. Importantly, this support seems to be a two-way street, as 64% of Georgians also say they can be helpful to many people outside of their families. The people we are around and who we rely on could be the main motivation for many Georgians to stay in the country, even when there are possibilities to emigrate and improve one’s living conditions. Though it is hard to talk about others – I know I am one of those Georgians. To learn more about the social networks of the Georgians, take a look at the data used in this post using our Online Data Analysis tool, here.